Tuileries Garden is a famous park in the center of the French capital, in the 19th century was a favorite leisure venue for the people of Paris. His reflections can be found in many literary works, also on canvases and in music. The first thing that comes to mind is Mussorgsky’s small garden, The Tuileries Garden, showing children playing in the park to us – the composer vividly portrayed him as light, spring, crowded. 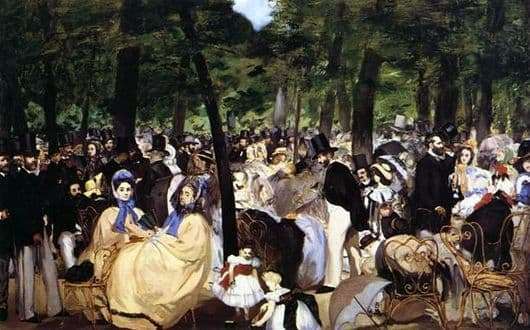 We see it the same in the Manet picture – children running around in the foreground, crowds of holidaymakers, a bright clear day… Among the people depicted in the picture you can find Manet himself, as well as his friends Charles Baudelaire, Theodore Gautier and Jean Offenbach. Mane completely rejected the academicism here, which suggested thoroughness in drawing details, and where there was not much difference in how you view the canvas – from close or far distance, on closer examination of the canvas, the part simply seemed to be enlarged. In this picture, the artist created such an effect that, upon close examination, the faces begin to seem to be some kind of incomprehensible color spots, and if you look at the picture from a distance, only then can you achieve portrait similarity.